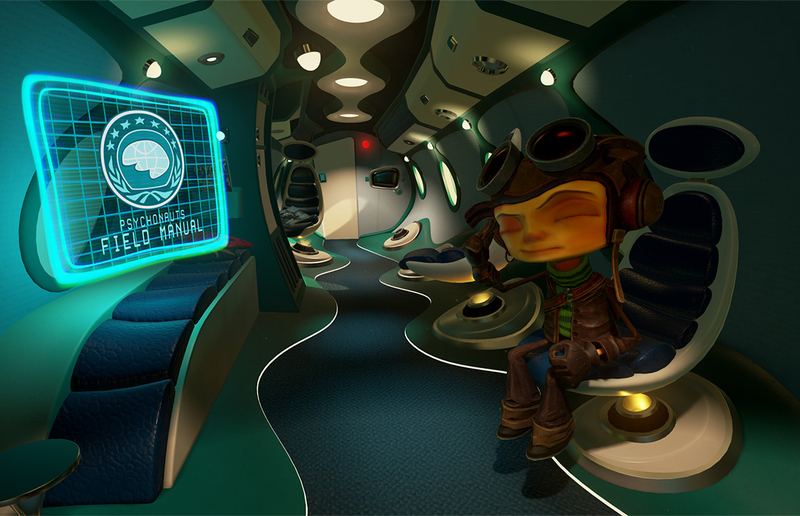 This VR adventure takes place in the Psychonauts universe, but does it live up to the original without feeling forced into VR? It's a point and click adventure in Virtual 3D! Made by Tim Schafer, a veritable Giant of the Genre (Monkey Island, Grim Fandango, Broken Age). What more could one ask for? Putting on the goggles and being inside one of my favorite gaming franchises felt like walking into a theme park made just for me. If you have an aversion to VR, this game is no exception. While personally I didn't feel dizzy or disoriented, I did get a tinge of queasiness, which is my "VR Indicator" to take a break. Everyone will, of course, react differently. Great for fans of Psychonauts and newcomers. A delightful, colorful, deliberately concise VR experience, that'll test your wit and make you chuckle along the way. To be honest, when I finished this game, I was sad. I WANTED SO MUCH MORE. My head was full of the places and adventures I wished they would've let me experience. But then I remembered that I bought it for only $15 through PlayStation Plus. I was treating it like a game I spent $60 bucks on. When it comes to Value, you get exactly what you pay for. Even though you'll want more. Written by the mad genius Tim Schafer, Psychonauts in the Rhombus of Ruin picks up where the original Psychonauts left off. I couldn't believe how easy and "snuggly" it was to fall back into this fiction. The premise is simple: the Leader of the Psychonauts is missing, and we've got to find him. Too bad all signs point towards the RHOMBUS OF RUIN, a Bermuda Triangle that fell into a Bermuda Triangle. Raz, the protagonist, is this great ball of heroic confidence and teenage insecurity that you can't help but relate to. One moment he's saving the day and the next he's wondering about his "new maybe not sure if it's official but he hopes it is" girlfriend, Lili. The story of this game sets itself up as a tantalizing bridge to the Psychonauts sequel, in development now. Also this game is riddled with that trademark Double Fine charming hilarity. I'm pretty sure I squealed a little when I realized that Psychonauts in the Rhombus of Ruin was a point-and-click adventure. It just made so much sense and lent itself perfectly with the fiction of psychic beings. You telekinetically grab, poke and burn your way through puzzle after puzzle. At times the game feels like it's holding your hand a little too much, which makes the experience feel more like a point-and-click adventure on rails. But what's more important is that the Gameplay is fun and intuitive from start to finish. It's simple and effective. That's what I want most out of my VR games. Simplicity. Sitting down, no hand wands, just a standard game controller and your head. Every move felt natural and more importantly, in character. The PlayStation VR hardware is comfy and never got in the way of the game. Is it still cliche to use the word "immersive" when talking about VR? Oh well I'm going to use it anyway: this game's environments were CRAZY immersive. From the inside of a Spy Jet, to a mysterious laboratory, to an underwater ship graveyard, each locale had me craning my neck to drink in every nook and cranny. But, to be more specific, the immersion tapped into a nostalgic side for me. There I was, inside a fictitious world that I had already fallen in love with 12 years ago. Wow. I absolutely love the artistry of this work. The Psychedelic Spy '70s motif gels perfectly with the story and its characters. Granted I'm basing my opinion on artistic choices over technical prowess. The graphic art design is so imaginative and dynamic that I felt transformed into a fellow Mind Traveler myself. But no, nothing in this game looks graphically "real" but it's not supposed to. It all looks like some wacky old forgotten Tim Burton cartoon, and that's great. That's '90s Tim Burton, to clarify... I ain't no fool. The voice acting is top notch. Bringing back the original cast from Psychonauts lent this game an authenticity and continuity that truly benefited the overall product greatly. Every little Spy gadget "whiz" and "pzzzt" sound effect was present and accounted for. Add an original James Bond-esque score and theme song composed by industry icon Peter McConnell, known for Sly Cooper, Grim Fandango and Monkey Island, and you're left with a game whose Sound is... quite "sound". Yea, I like what I did there. Each new area serves as a level which had its own problem to solve. It's very straightforward. Solve the problem, then float to the next problem. I do wish there was even more to investigate in each of these areas. Some places let you tinker with various props strewn about, but still I wanted the freedom to further stretch my telekinesis. The areas were just so beautiful and interesting, that I wanted more silliness to do within them.